If you could go back to a Victorian Christmas season, you would learn quickly that most trees were decorated with home-made ornaments, often of paper. This page contains links to Victorian-era paper ornament projects that you can do with a colored printer, a few sheets of card stock or acid-free paper, a bit of glue or tape, and a pair of scissors. Although the crafts date back to the 1800s, we have printed the patterns on our original, color-coordinated, vintage-style print patterns that will make your Christmas tree look traditional, homemade, and classy, all at the same time. Best of all, all of the crafts on this page can be done by children as young as six with only moderate supervision (and younger children with closer supervsion). Remember to use acid-free paper if you want to use the ornaments you make this year next year, too. One of the best features of this project is that the ornaments collapse flat when you're done with them, so you can store a whole tree's worth of ornaments in a shipping envelope if you want to. And if you want to keep some little hands busy on a rainy December day, you'll find these projects more than helpful. Note About Copyright: The following craft papers and patterns were created specifically for FamilyChristmasOnline and are copyrighted by Paul. D. Race. You are not allowed to sell printouts of these patterns or publish them in paper or electronic (including web) format. However, you may use them yourself or use them in a classroom or senior setting. Also, if you have a web site and want to link to our pages, you may (please let us know, so we can visit your web site too, and maybe link back to it). Spiral Ornaments - This is the simplest pattern on the page, which means it's very rewarding for little fingers. The spirals also turn in light breezes better than any other paper craft, which makes them more interesting for small ones to hang. Japanese Lanterns - This is based on the classic kindergarten craft, updated with new vintage-style colors and patterns - you never knew they could be so tasteful. Droopysquares - This is based on another children's craft that goes back at least a century. Droopysquares provide a lacy-looking counterpart to the other ornaments in this section. Droopycircles - This is the round version of the Droopysquare; they are also an easy way to provide a complex-looking texture to your tree. Christmas Puffballs - This is an old orgami favorite that looks great when you do it with a patterned Christmas paper (like ours). Like the other ornaments on this page, it folds flat for storage. But it can also be used to hold small presents. We have other crafts for this section "in the works," so please check back once in a while. While we were putting our own craft patterns and papers together for this Christmas season, we've also been collecting links for other people's paper-based crafts that are both worthwhile and child-friendly. Again, we are adding other links as suggestions come in. If you have found a worthwhile link that you think fits in here, please let us know about it. Or if you have any corrections or suggestions, or anything else you'd like to share with your fellow readers, teachers, and craftspersons. Jan Brett's Paper Ornament Page - Gives ideas for three different crafts that can be made with paper, scissors, and crayons or colored pencils. Printable 3-D Paper Snowman - requires typing paper, scissors, tape or glue, and a computer printer (to print the downloadable pattern). The end result isn't dramatic, but it's a quick way to give a kid something to do. 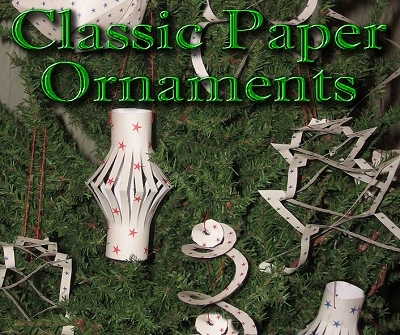 Several other paper-based crafts are listed on our Christmas Craft Resources page. We have more patterns and craft suggestions in the works. So keep checking back. And contact us with any questions or suggestions you have in the meantime. Especially contact us if you have any craft ideas you'd like to share with our readers. To return to the Family Christmas Online™ Home Page, click here. Note: Family Christmas Online™ is a trademark of Breakthrough Communications(tm) (www.btcomm.com). All information, data, text, and illustrations on this web site are Copyright (c) 2006, 2007 by Paul D. Race. Reuse or republication without prior written permission is specifically forbidden.